CAST: innovations in concrete , an exhibition which opens later this week at The Lighthouse in Glasgow, will explore the versatility and development of concrete. It shows how concrete has allowed designers to create complex, previously impossible, forms such as the flexible concrete diving platform at the London Olympic Aquatic Centre designed by Zaha Hadid. Concrete is used more than any other man-made material on the planet and is perhaps thought of as a modern material but it can be found in the pyramids of Giza, was perfected by the Romans and has been continuously developed through the centuries to the point where it can be used to make everything from canoes and vanilla-scented concrete. The exhibition – which takes a Scottish perspective – features the work of architect’s Gillespie, Kidd & Coia and uses images of their celebrated St Peter’s Seminary in Cardross from our archives. The exhibition explores everything from the use of concrete use in defence, leisure and play to how it has been used to support the renewable energy sector and improving transport and communications in remote areas. It also looks at how the increased re-use and use of reclaimed materials in concrete is changing the perception of concrete in terms of its environmental sustainability. The exhibition will also give the visitor a chance to see how concrete is created and the impact it has on our culture, built environment and architecture. A Seminar Programme examining the key themes has been designed to complement the exhibition. For information about related events and seminars visit the Architecture and Design Scotland website. The exhibition opens on 11 October in Gallery 2, Level 2, The Lighthouse, 11 Mitchell Lane, Glasgow, and runs until 28 November 2013. For more information visit the website. 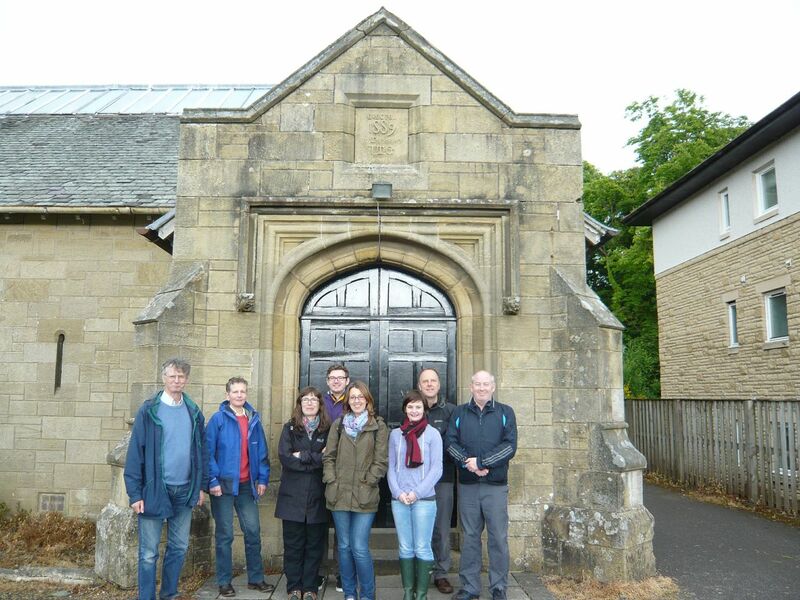 Last Saturday, a troupe of intrepid ramblers, otherwise known as GSA Library & Learning Resources team, embarked on a self-guided tour of the Kilmahew Estate in Cardross. We had absconded from Garnethill with one simple mission: to find the ruins of Gillespie, Kidd & Coia’s masterpiece, St Peter’s Seminary. And, of course, to discuss it over lunch! It’s fair to say that this had all the hallmarks of a Gillespie, Kidd & Coia pilgrimage being made in the footsteps of early Christian missionaries, Scots nobility and trainee priests as we soon discovered from our appointed tour-guide, Architecture Librarian David Buri! We set off in the morning under a murky-looking sky and proceeded into the woods at Kilmahew Estate – a moving sea of cagoules and backpacks. 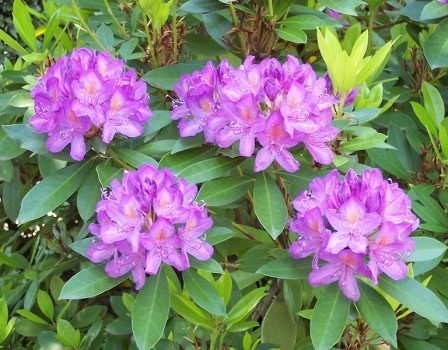 Thankfully for us, the weather was on our side, and as we progressed further from the perimeter and through the rhododendrons, the only thing we had to fear was the odd crack of a golf-ball from Cardross Golf Course, in dangerously close proximity to the track! Stepping through the undergrowth, we tried to recreate in our minds the original grandeur of the the estate’s ornamental gardens, driveways and parkland. Two exceptionally tall redwood trees flanking the path at the original entrance were a reminder of the estate’s historic roots and the status it would have enjoyed, only decades ago. At the top of the route we reached our destination: the dramatic ruins of St Peter’s Seminary, built in the 1960s and abandoned since 1980. The post-apocalyptic scene we encountered is something to behold: a derelict building, ravished by time, blemished by grafitti, yet still powerfully capable of inducing frissions down the spine. Perhaps it’s down to our current fetish for all things Brutalist, but this was similar to experiencing the sublime in nature – achieved through architecture! The photos we’re used to seeing in the GKC Archive in GSA’s Archive and Collection Centre are black and white so we were unprepared for Kilmahew Estate’s vivid colours. Sienna-cobbled stonework, red tree-bark, green, lilac and pink shrubbery and neon grafitti have created a unique collage: something like a forgotten space-ship crash in medieval times or the set of a science-fiction film! At close range, it’s overwhelmingly apparent why the seminary is often given the accolade of being the best example of work by partners Andy MacMillan and Izi Metzstein and is revered by many as the most important piece of twentieth-century modernist architecture in post-war Britain. The contrasting curved and angular walls of the complex envelope the ruins of the once standing Kilmahew House which once stood as the structure’s fourth wall. The majestic design and the scale of the concrete build is incredible; as too is the clear level of disrepair. We were thrilled, surprised and dismayed all at once! As one of the few post-war buildings to be granted A-listed status, there is something melancholic and aesthetically-alluring about the seminary’s abandonment, demise and unorthodox appropriation by grafitti artists. While its conservation seems to be something of an architectural frisbee, plans to conserve it as a community space were submitted by landscape architects erz in February of this year. To read more about the proposed rehabilitation of St Peter’s, make sure to check for updates on Glasgow Architecture’s website. Reincarnation emerged as a recurrent theme as we followed the tour onwards. The entire Kilmahew Estate has had many incarnations – each new vision and design has been followed by decline and ruin. After the excitement of the seminary, we also discovered the ruins of nearby Kilmahew Castle, and explored the gardens where an ornamental pond, waterfall and rhododendron tunnel can be found. It was then onto a nearby farm-shop and tearoom for a well-deserved lunch and post-tour analysis! We even found time to stop at nearby Geilston Hall on the road back to Glasgow, a drill-house designed by a young Charles Rennie Mackintosh in 1889. The tour is free to download from The Royal Geographical Society’s website as part of the Discovering Britain project. You can download written and audio guides from the website. 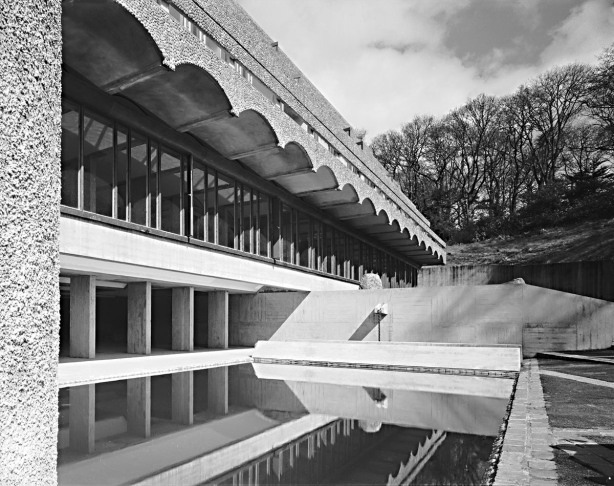 The booklet (available to download here: Kilmahew – walk booklet and in stock in GSA Library) includes the black and white images of St Peter’s Seminary from the GSA Gillespie, Kidd & Coia archive. Check the ACC blog for related GKC posts. Reblogged from GSA Library’s Architectural Resources blog. The Royal Geographical Society has just published a brand new walk (see the Kilmahew walk eflyer) as part of the Discovering Britain project. 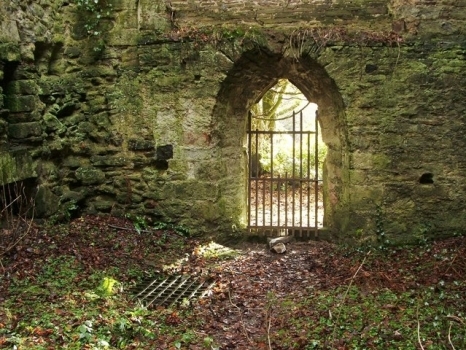 Hidden in the woods of Kilmahew Glen is an abandoned country estate with the ruined remains of habitation from the medieval to the modern period. Kilmahew has had many incarnations, each new vision and design has been followed by decline and ruin. Amidst a landscape of woods and rhododendrons are stone, brick, iron and concrete features that offer a tantalising glimpse of the buildings and structures that once stood here. 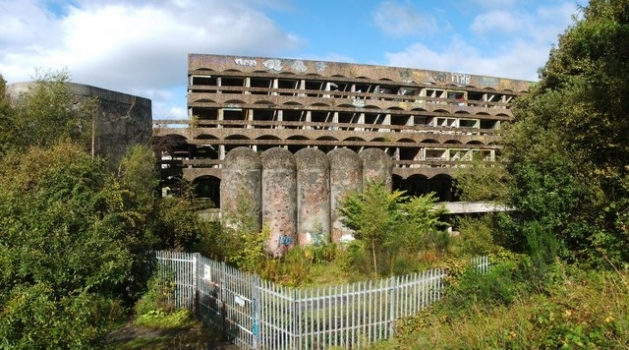 The walk features the ruins of St Peter’s Seminary, Gillespie, Kidd & Coia’s architectural gem. Built in the 1960s, the site has been abandoned since 1980. 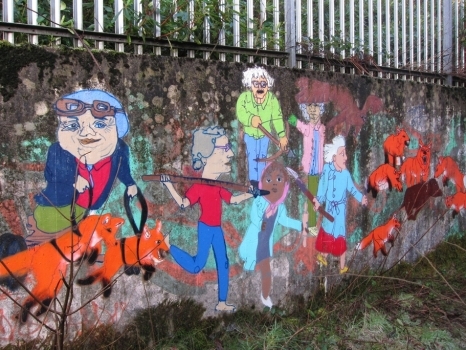 On the walk you can find out about how an arts organisation is planning to revitalise the site. You can download written and audio guides from the website. The booklet (available to download here: Kilmahew – walk booklet) includes some nice images of St Peter’s Seminary from our Gillespie, Kidd & Coia archive. For more information about the Gillespie, Kidd & Coia archive at Glasgow School of Art, see here. 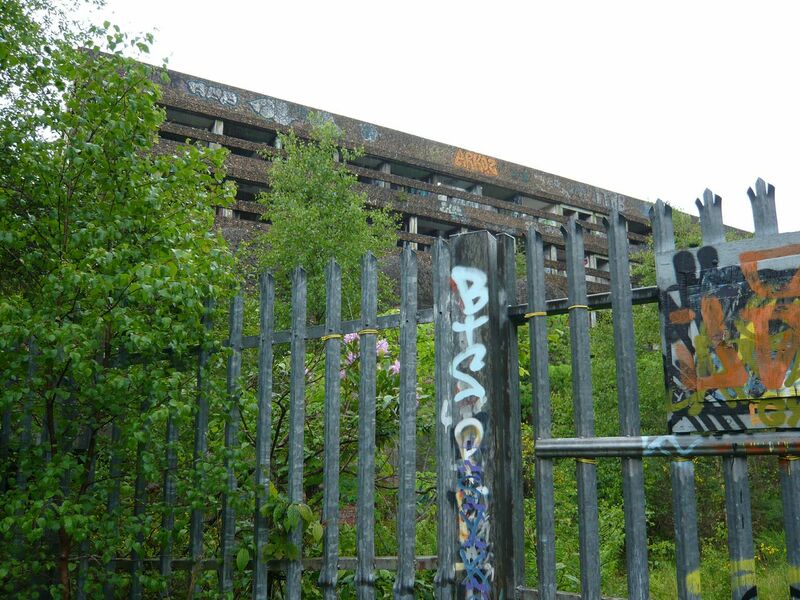 See also our recent post about BBC Radio 4 programme The Concrete and the Divine, which included an interview with GKC partner Andy MacMillan.